Detroit Urban Craft Fair this weekend! If you're in the SE Michigan area this weekend I hope you'll stop by the Detroit Urban Craft Fair and say hello! 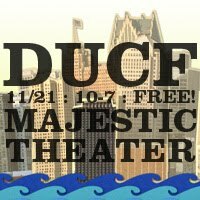 It's a free event this November 21st at the Majestic Theatre in Detroit, MI. Many terrific indy arts vendors will be there, including the Tiny Astronaut Press crew: Mark Rudolph, Anne Drozd, and me! We're debuting some new items at the show, including the Switch Runners Artist Edition, and the new "Pocket Edition" of The Front! We'll also have some items previously only sold online, like our Tiny Hamilton mini-comic. On top of all that, we'll be giving away absolutely free comics to kids!